What is the Meaning of the Word Ajax? Why this name, Ajax? Who gave it that name? And should we write AJAX or Ajax? The author chosen to write Ajax rather than AJAX, it is a term coined to simplify the communication and not an acronym. It's in an article titled Ajax: A New Approach to Web applications, published on the Adaptativepath.com site on 18 February 2005 that J. J. Garrett has defined the term Ajax, which has popularized the technology. This formulation with a + instead of AND seems strange to some, it is actually inspired by how are written compositions of molecules in biology. A manner to say that Ajax is mostly a combination of components that must be put together to give its powerful effect to this tool. The term asynchronous means that exchanges are made with the server asynchronously: requests to access the contents of files on the server are launched through the XMLHttpRequest object, without the browser waiting for the answer. 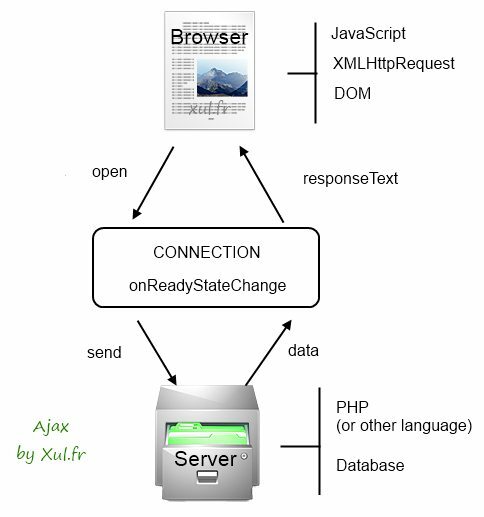 Once the answer is provided by the server, it is processed by an event handler defined by an Ajax script. The advantage is the fluidity of web pages that are updated without waiting delays. The word XML although it appears in the name does not mean that Ajax requires this format. On the contrary the XHR object supports perfectly files in text format. Although they do not appear in the name, Ajax also includes two other standard Web technologies: CSS (Cascading Style Sheet) for the presentation and DOM (Document Object Model) to access the content of pages with scripts. The creation of the name was enough to popularize the concept which itself is just a combination of already known technologies. Actually Ajax is a combination of DHTML (Dynamic HTML) and the XMLHttpRequest object, which keeps the interface of the XMLHTTP ActiveX object created by Microsoft for Internet Explorer 4 in 1997. The article that has coined the term Ajax and popularized the technology and so encouraged the development of dynamic Web sites and the Web 2.0.